Literally. The baby, I mean. And inside me, not out. Still pregnant. Still working. And still waiting...very impatiently I might add. I've gone to bed each night this week convinced that I will wake up in labor. And each morning at 5:30, I've unpleasantly awoken to my alarm. I know I said I wanted to make it through this week of school, but that was weeks ago before I was literally exhausted after teaching each block. I'm so ready to be done with school and even more ready to get this baby out. Last night, I ate spicier-than-I-prefer Thai food. And then walked for 35 minutes (2 miles) on our treadmill, hoping contractions might start. Nothing. Nada. And still no signs. How can one be 4cm and 80% effaced and still pregnant three days later? At this point, I would welcome my water breaking at school! 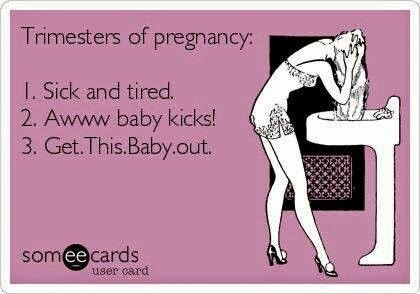 This is definitely the worst part of pregnancy for me. The waiting. And not knowing how or when it will all go down. I'm a planner. I don't do well in situations like this. I wish I didn't know how dilated I am. Or how thin my cervix is. Because it has given me so much false hope. False hope that has only resulted in a very disappointed mama as the days s-l-o-w-l-y pass by.